I just saw all this stuff this morning, so exciting!!! And now I find out I am leaving for Japan on Monday, been quite the week so far. Brett wrote: I just saw all this stuff this morning, so exciting!!! And now I find out I am leaving for Japan on Monday, been quite the week so far. Exciting indeed. Safe travels brotha! Thanks man I will still be hanging out on the boards while I am away, and eagrly anticipating the news that we have been awarded a team!! So is anyone on here planning on registering for season tickets on the 1st ? If not do you know anyone who is ? I personally am not able to do this as much as I would love too do so, but today at work I have been asking around and I have found 4 people just today who plan on putting deposits down on the 1st. I am plunking the dough for two seats, I won’t be able to make anywhere near all of the games, so I am hoping to offset some of the ticket cost by selling them. I may break even, I may get hosed, who knows. I do know that there is nothing in my mind that compares to seeing an NHL game live. The speed, and athleticism is amazing. It might be a one and done year for me, but I hope it will be a hell of a year. Brett wrote: So is anyone on here planning on registering for season tickets on the 1st ? If not do you know anyone who is ? Was thinking about it until I found out my long time day job is going away Spring of 2019, last week. Still thinking about it. Not sure. I was all set to, but had an unforseen major expense a few days ago, so it may no longer be financially feasible for me. That being said, I'll still prolly plunk down the money in a few weeks, I'll just be extremely low on the priority list at best. 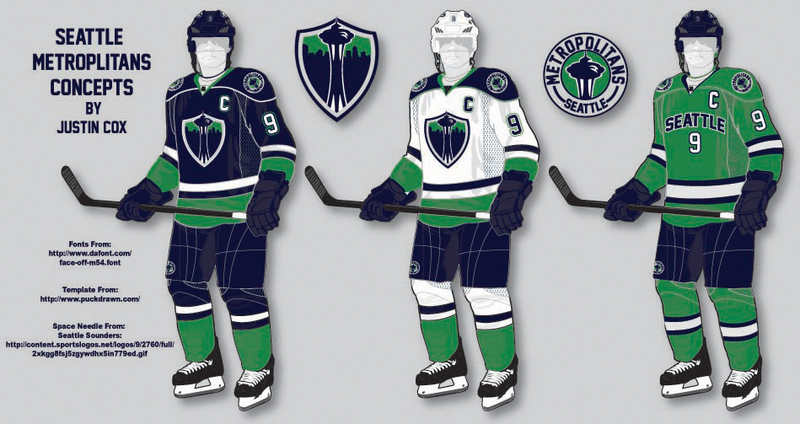 gowazzu02 wrote: It would have to be the Seattle Metropolitans wouldn't it? I mean theres history already there. I like this fan mockup of the potential jerseys. Horrible name, please don't bring it back. And there's already a Totems minor league team, do something original. tacomahawk wrote: I am plunking the dough for two seats, I won’t be able to make anywhere near all of the games, so I am hoping to offset some of the ticket cost by selling them. I may break even, I may get hosed, who knows. I do know that there is nothing in my mind that compares to seeing an NHL game live. The speed, and athleticism is amazing. It might be a one and done year for me, but I hope it will be a hell of a year. You should be able to get pretty good money on the secondary market if you opt to sell tickets for the Caps,Pens,Leafs,Bruins,Canadiens,Oilers x 4, Canucks x4, Blackhawks. Especially if they happen to be on a Friday/Saturday night or Sunday afternoon. You'd obviously have to weigh that against the appeal of seeing Ovi, Crosby and McDavid in person yourself. The frequency with which McDavid will be playing in Seattle is a huge bonus if Seattle is placed in the correct division. And for the least shocking news of the day! But from what I've read in a few different facebook groups, people have been dealing with crashes since it went live. This may be me reading too much into renderings but I have noticed that since it all became official every rendering has been a red/white/black scheme. I can't help but wonder if that will be team colors. If memory serves me correctly, the early renderings before OVG won out were green/white. EDIT: The NHL 2020 that is currently being raised at the top of the Space Needle is also red/white/black. Last edited by ballhawks12 on Thu Mar 01, 2018 12:05 pm, edited 1 time in total. Freaking AWESOME! WTG Seattle hockey fans! Considering the overwhelming interest for season tickets, I'm curious as to how many single game tickets will be reserved for the general public. I read on Reddit that Vegas had capped season tickets at 16k and reserved 1,500 for single game purchase, but I don't know how legit that is. I wouldn't think they would fill every seat with a season ticket holder, but who knows? seaky12 wrote: Considering the overwhelming interest for season tickets, I'm curious as to how many single game tickets will be reserved for the general public. I read on Reddit that Vegas had capped season tickets at 16k and reserved 1,500 for single game purchase, but I don't know how legit that is. I wouldn't think they would fill every seat with a season ticket holder, but who knows? I think it'd go the same as Vegas, every sports franchise holds a small amount of single game seats whether the season tix are maxxed out or not. Seahawks do it, it's just good fan relations. Amazing. Well NHL, are you satisfied?? The NHL never didn't want to be here. Otherwise they wouldn't have re-opened expansion talks for Seattle only. The problem was the idiot city council that refused to work with Chris Hansen because they wanted to own the arena, and the complete inability of any potential ownership groups to find their butts with both hands. The NHL has wanted to be here for decades. All I know, that in Vancouver it's just about impossible to get a ticket. The arena is only going to hold 17500? Isn't that quite small? I was thinking modern arena's were upwards around 24k or so... damn. Bonderman had a handshake deal with the NHL the day after the Sonics left.......but then the 2008 recession hit and all hell broke loose both politically and financially for everyone involved. And the council didn't want to own the arena, they just wanted someone to fix THEIR arena. That's why Hansen got stonewalled. You can thank the &%$#ing Seattle City Council for that. Actually hockey arenas are mostly in the 17-20k range. The Key will be about average in the league. The biggest hockey arena in the league is in Montreal, and that only sits 21k. Winnipeg only seats around 15k. As many things there are that you can blame the city council for, this isn't one of them. Last edited by KK84 on Thu Mar 01, 2018 1:45 pm, edited 1 time in total. 17,500 is in the middle somewhere for both NBA and NHL arenas, and none are bigger than 20k. So no, it's not cause the council is stupid, well they are stupid, but for other reasons. It's because both leagues told Bonderman and the city 17,500k is the optimal capacity for their sports. What I meant was that if Hansen had built his arena, it probably would have been higher capacity than the 50 year old boondoggle the City Council won't let go of that was one of the smallest in the NBA 10 years ago. I think Hansen's arena renderings had the SoDo arena at around 19-20k? Idk, why are we crapping on what's going on today for again? Who cares what the capacity is? Get excited man, we're bout to get freakin' NHL hockey. Just an observation from my wife that I missed.... They sold the required 10,000 season tickets in 12 minutes... What the hell is it with that number in this town?? Also heard a great name suggestion from some guy on Kiro... The Seattle Sockeye's. I think that's pretty good. Starts with an "S" to go with Seattle, is a Northwest salmon, and "Sockeye" speaks to Hockey itself... I would approve of this name. Absolutely agree! This is a GREAT DAY for the Seattle sportsfan! I heard the NHL commish was blown away by the outstanding season ticket drive today! BlueThunder wrote: Also heard a great name suggestion from some guy on Kiro... The Seattle Sockeye's. I think that's pretty good. Starts with an "S" to go with Seattle, is a Northwest salmon, and "Sockeye" speaks to Hockey itself... I would approve of this name. We see enough damn fish every time a sports media event happens here, Pike place market, Sockeye Salmon, born in a river swim out to sea eat like hell, swim back up the river, either lay eggs or squirt sperm on them, Fight like hell if you get one on line though. I wouldn't mind "Sockeyes". Still prefer Metropolitans. Really really want the original uniforms to stay. "Don't fix what isn't broke". I've been for that name for ages. I posted a uni mockup I found online a few pages back in this thread. Indeed it is. I expected a high turnout for season tickets but it was way way more than I anticipated. I'm extremely happy that it went as well as it did. That said, it's going to be extremely hard to nab one of the single game tickets, considering the interest. I dread seeing the secondary market value but what can ya do? Fish names tend to catch a lot of flack but truth be told, I do like the Sockeyes. Not my first choice, but definitely top 4-5 for me. When we had an indoor football team in my area, there was another team a few counties over that went by the Northern Kentucky River Monsters. I loved the uniqueness of the name and uniforms. I agree..BUT if we are named after a fish it should be the King Salmon..
have never seen saltwater fish to know any better. One team will have to be moved from the division though, and my money would be on Phoenix moving to the Central division. Edmonton and Calgary will definitely stay in the Pacific, so you'll be getting McDavid a bunch of times a year for sure. Lol, it isn't anymore. You should see the empty seats in the building unless the Leafs or Habs are in town. Until we start winning again, you'll be able to get a ticket no problem. Totems or Steelhead are my top two choices. I know Steelhead is still a fish, but at least it's a tough sounding fish. Not crazy about Sockeye or Metropolitans. Yeah my dad used to fish a lot in the Sound and we had a cabin on Hat Island right close to a shelf in the Sound and caught fish all the time, he got a 56 pounder one year which is a big fish inland. Damn thing was in his freezer for a year before he actually cut it up. Caught several that size or so off of Westport back in the 80's, now that size is a rarity with the amount of over fishing done. Your absolutely right. No way that Seattle, Vancouver and the Alberta teams aren't in the same division. Throw in Cali and it is going to be a lot of fun. The speed at which Seattle hit those numbers with deposits has certainly gotten a lot of attention here in Canada. I didn't realize that there would be that much interest even though I knew there was a pretty good following for the junior teams in that area (took me a while to get over that game 6 OT loss for my Pats vs Seattle last year). Would make for a nice sports trip for those of us who have to travel to get to Hawks games to tie in a Sat night NHL game with a Sunday NFL game. BTW it's a Key Arena upgrade right? How is it being funded? The fight for a need for a new stadium in Calgary and public money has gotten pretty nasty here in Calgary between the team and city. HawkRiderFan wrote: BTW it's a Key Arena upgrade right? How is it being funded? The fight for a need for a new stadium in Calgary and public money has gotten pretty nasty here in Calgary between the team and city. It's being funded privately by OVG. I don't think any of this would have happened other wise. HawkRiderFan wrote: The speed at which Seattle hit those numbers with deposits has certainly gotten a lot of attention here in Canada. I didn't realize that there would be that much interest even though I knew there was a pretty good following for the junior teams in that area (took me a while to get over that game 6 OT loss for my Pats vs Seattle last year). Seattle's a true metropolitan city full of people from all over the place that love hockey. It's also why soccer is so popular. I also think there's a LOT of anger and resentment from affluent sports fans within a 50 mile radius over the Sonics leaving, so they were fired up and were ready to show the sports world how passionate they are for a winter sport. I'm starting to warm up to the Totems as the name for the NHL franchise. Would the T-Birds move now that NHL is in Seattle? This has to impact them considerably. hawkfan68 wrote: I'm starting to warm up to the Totems as the name for the NHL franchise. Would the T-Birds move now that NHL is in Seattle? This has to impact them considerably. Eh, they're already based in Kent. I could see them changing the name from Seattle Thunderbirds to Tacoma Thunderbirds, though. I mean, they're technically closer to Tacoma, anyway, and the name would be alliterative, which I think is cool.